The illustrator Jonny Hannah was born and bred in Scotland, and now lives by the sea in Southampton, but he also resides in Darktown – a mysterious coastal town, not found on any map, peopled by pin-up girls, jazz artists and tattooed sailors. Darktown is home to the Unquiet Grave junk emporium; the Mermaid Café, where folk legend Woody Guthrie still plays each week; McVouty’s vintage clothes shop; and a pier with a condemned helter skelter. 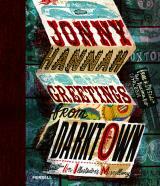 Joining Hannah on his trip to downtown Darktown are the writers Philip Hoare and Peter Chrisp, who explore the eclectic influences on Hannah’s work, and Sheena Calvert, who introduces a special typographic catalogue of hand-drawn lettering. As he tours Darktown, Hannah presents his prints and paintings in thematic chapters reflecting his passions, and bids farewell to his alter ego, Rocket Man, who inhabits the darkest corners of pop culture. Sheena Calvert has more than 20 years’ experience teaching critical theory, graphic design and typography at various art and design institutions in the United Kingdom and the United states. Peter Chrisp is a writer and artist who has published more than 60 history books for children. Jonny Hannah studied at Liverpool school of Art and Design and the Royal College of Art, London. His illustrations have appeared in such publications as the New York Times, the Sunday Telegraph and Vogue. Philip Hoare is a writer and cultural historian. His book Leviathan or, The Whale (2008) won the Samuel Johnson Prize for Non-fiction in 2009.